It’s undeniable; the flash of a big beautiful smile or a shy little smirk can speak volumes without you ever saying a word. It can attract attention from across a room. It can stop a disagreement in its tracks. It can convey your deepest emotions without a single word spoken. A smile is an indicator of happiness, success, and self-worth. Is your smile sending the message you want it to? A smile is one of the first things we notice about others, and it can speak volumes about you without you ever saying a word. If you are not entirely happy with the appearance of your smile, chances are you are not sending the message you would like to. A simple fix or a full smile makeover will ensure your smile will be remembered for all the right reasons. A beautiful new smile will drastically improve your overall appearance and take years off your look. You will gain a newfound sense of confidence that others will notice in the way that you carry yourself and show off your beautiful new smile. You will notice new doors of opportunity beginning to open all around you from your personal relationships to career opportunities and beyond. Do you find yourself feeling envious of others who somehow have the most perfectly straight and bright white smiles? We’re here to let you in on a little secret—they probably weren’t born with it. With modern techniques and technologies, your dream smile is within reach. You will still look like you, only better! Porcelain veneers are a cosmetic treatment to correct any number of minor imperfections in the appearance of your smile. Veneers can correct teeth that are slightly crooked, misaligned, gapped, chipped, broken, misshapen, oddly sized, yellow or discolored. The difference you will see in a professional whitening treatment is a more dramatic result. While toothpaste and white strips can whiten teeth by a few shades, a professional whitening treatment is the only way to penetrate the teeth deep enough to remove intrinsic stains. If you show more pink than white when you smile, you’re not alone, and we can help! Gummy smiles happen when the gums cover too much of your teeth. So, it’s not that your teeth are “short”, but rather that your gums are trying to steal the show. Thankfully, we can correct this with laser gum contouring. Laser gum contouring is just like it sounds—using a dental laser to precisely and carefully reduce the gum tissue along the gum line, creating a more natural and beautiful grin. A gummy smile can really put a damper on your confidence, so if it’s time for your teeth to take center stage, let us know! If you have any minor grievances with the appearance of your teeth, cosmetic bonding is a simple solution. A durable, natural-looking tooth-colored resin is used to enhance the appearance of your natural teeth. Cosmetic bonding can correct teeth that are gapped, misshapen, or discolored. Bonding is a fast and easy way to refresh your smile and rejuvenate your overall appearance to get back that youthful glow. 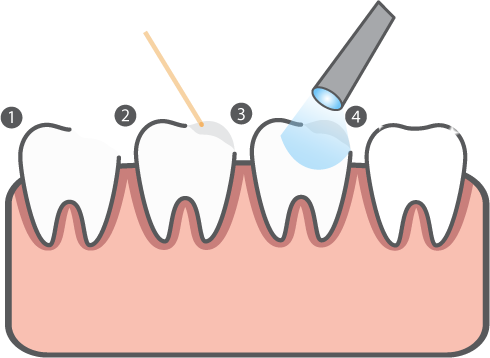 Bonding is a simple, non-invasive treatment that involves a tooth-colored resin to hide stains, fill gaps, build out chips, and correct any minor cosmetic issues without major treatments. If you’ve been hiding your smile, we want you to know there is a solution at Fuquay Family Dentistry. If you have any questions about cosmetic dentistry or would like to schedule an appointment with your Fuquay-Varina cosmetic dentists, please contact Dr. McCormick, Dr. Meunier, or Dr. Adams today!